In college I studied Product Design: Textiles Technology - they didn't have Graphics, which is more my thing. Now instead of experimenting with computer software and digital media, I find myself merging fabrics and technology together. This is much more fun than it sounds. Behold the Bernina CAD/CAM sewing machine (costing around £1000). CAD/CAM stands for Computer Aided Design = using computers to design anything from socks to giant architecture; Computer Aided Manufacture = using computers to turn those designs into the full product. Blast, my full name wouldn't fit. 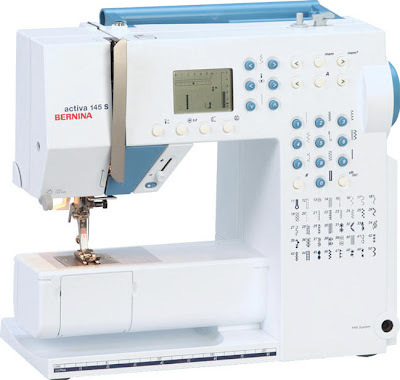 The Bernina sewing machine has around 30 set embroidery designs in memory but the HUGE advantage of connecting it to computer is that WHATEVER I want, from full person-portraits to brand names, can be sewn onto clothing, toys etc in a matter of minutes. I never thought of branding my clothing... that's shallow. Still, a very sleek piece of equipment. I have a Brother [link]. Anyone else out there a sewing fanatic?